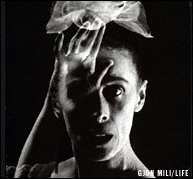 Martha Graham was born in 1894. In the 1920's she danced at the Denishawn school of Ruth St. Denis and Ted Shawn, who were her forerunners in the development of American modern dance. They had a lot of influence on Graham's ideas on dance, for example in the way they used different dance traditions in their work to create a new dance style. In 1923 Martha Graham left Denishawn, and started working as choreographer of her own dances. She wanted to go further then Denishawn in creating a new sort of dance. For Graham, modern dance in the 1920's was still too traditional and `romantic'. Martha Graham developed a new dance-technique, and new ideas about dancing. But in this essay I want to examine more the outer aspects. In what way did she make modern dance more popular during the 1930s? In different ways her dances reflected American society in the thirties. First it is important to look at Graham's forerunners in the 1920s. Modern dance began on the east and west coasts of the United States: with Isodora Duncan, Loie Fuller, and Ruth St. Denis. The first modern dancers revolted against the classical ballet, which was considered European, and high culture- performance. Isodara Duncan was, around the turn of the century, the first dancer and choreographer who tried to change American dance. She looked at primitive dances and other cultures for inspiration. She thought these different styles in dancing had something the European Ballet did not have. She also used more popular sorts of dance, like tap, and jazz-dance. With all these different influences from different cultures Duncan wanted to create a new style. Although she was very successful, she only became popular in Europa, and not in her native country. "Her career far remained oriented toward Europe and European taste" (Macdonagh, 21). The Denishawn company was developed by Ruth St. Denis and Ted Shawn, and during the 1920's it was the chief dance force in the United States. Denishawn schools were established across the country and the company toured in the United States and abroad. The second wave of theatrical dance grew out of the Denishawn-school. Martha Graham, Doris Humphrey, and Charles Weidman all left Denishawn a few years after one another, and started making their own choreographs. Their work reflected the influence of the Denishawn school. Yet during the 1930s they developed their own direction in modern dance. Rebellion against the exotic romanticism of the Denishawn company was to be a major thrust of the modern dance movement, and Denishawn was formally disbanded by the end of 1931. Modern dancers in the 1930s wanted to reach more people. They wanted to create dance as an art form, but it had to be for the people. "What made the new dance `modern' was its subject matter and, along with its revolutionary stance on stage, its progressive positions off the stage. The issues of the Spanish people's fight against fascist takeover (1936-1939) and the worker's movement in the United States were linked by an overarching concern for the lower ranks of society" (Wheeler, 34). In this way it is comparable to other forms of art in the 1930s. Especially the theatre plays in these years showed a concern for social and political issues. Dance, as a theatre art, could do the same, but is was more in a symbolic, abstract way, since it was mostly non-verbal. As was the case in general with `the fervent years' of the thirties, modern dancers zealously supported unified group action as the key to humanity's struggle against oppression, be it economic or military. Socialism also was alluded to in much of the choreography of the period through the New Deal Dance Progam, which was part of the Federal Theatre Project. Although Martha Graham did not take part in this project, she was influenced by the same ideas. dances in 1929, with the dances `Heretic' and `Sketches for the people', which were studies for mass movement. Although they were apolitical, they had a clear social message. Some of her works were political. Between 1936 an 1939 she showed her support for the Spanish in the Franko war. Graham's dances `Immediate tragedy' and `Deep song' were about the Spanish war. The dances showed sympathy for Spain and commitment towards social relevance. It meant Martha Graham's movement toward social realism. Some of Graham's works of the early thirties expressed a special interest in primitive culture. In that period she made a trip to New Mexico and became interested in the American Indian culture in that part of the country. She produced works like `Primitive Canticles, `primitive mysteries' (), `incantation' and `Dolorosa' (all 1931), and 'ceremonials' (1932), in which she distilled a pre-Christian religious sentiment into generally applicable terms. (MacDonagh, 31) She later began to develop a line of choreography that dealt with the specifically American Mythic heritage. The first of these works was `Frontier'. There were various ways in which Martha Graham tried to express the American experience. First of course in the subjects of the dances and the characters she created; they had to be typical American characters. She tried to express this in the movements: the dancers used for the public recognizable, symbolic movements, and everyday movements. But it was also visible in the clothes and the decor. I want to show these elements with examples of dances she created: Frontier (1935), American Document (1938) and Appalachian Spring (1944). Frontier is one of the first dances with a typical American theme, and Appalachian Spring is the last one; after 1944, she turned her interest to other subjects. Frontier was Graham's second direct exploration of the American theme. This dance, which lasted only seven minutes, was a solo, danced by Martha Graham. `Frontier' used space expansively. The solo figure in `Frontier' evoked the idea of a particular type of person, the nineteenth-century pioneer woman, through her movement and her costume: Graham wore a stylished version of a nineteenth-century homespun dress. (Thomas, 117). The movement was outward-directed. In comparison with her dance `Lamentation' (1930), which was minimalist and introspective, `Frontier' was positive and outward-going. It was the beginning of Graham's development towards an integrated dance theatre. This work was not only well received in her time, but has also become a modern American classic. The music for this dance was composed by Aaron Copland. "Simply stated, on the surface level, Appalachian spring tells the story of a young couple being married and taking possession of their newly built homestead". It is set in a small community on the American frontier in the early nineteenth-century. The source of stability and support in the small community is represented by an older pioneer woman. The wedding ceremony is presided over by a Revivalist priest, who is accompanied by four girl followers. "The focus is directed toward the moods and feelings of the central characters, their strengths, religion, hopes, fears, and aspirations for the future in the newly settled land" (Thomas, 145). In various ways the dances of Martha Graham in the 1930s were influenced by the political and social climate of the decade. Just as other artists in that period she had attention for social issues, and sometimes she used explicit political issues, as in her support for the Spanish fighting against fascism. In this way the 1930s, until the creation of `Appalachian spring' in 1944 stand out as a different period in her career. After 1944 she started using different subjects again, mostly from Greek mythology. But the way in which her work in the 1930s was revolutionary, was the attention she paid to the typical American situation, and the `American experience'. This made her famous in America. And it also made modern dance more popular in America. For this reason she may be called one of the most important pioneers of American Modern dance, a style of dance that still has a big reputation in the United States, but also internationally. Wheeler, Mark, `New dance in a New Deal era', Overby, Lynette Y. and Humphrey, James H. ed., Dance. Current Selected Research, vol. 2, 1990, p. 33-46.